Ultra Bowling Ball 5 lbs. Molded 1-piece rubber bowling ball eliminates the bonding process and is guaranteed not to split. Includes 2 sets of finger holes to accommodate all ages and sizes of hands. Latex Free. Blue. 5 lbs. Approx. 8-1/2" diameter. The thumb hole is 0.96" diameter and the finger holes are 0.9" diameter. 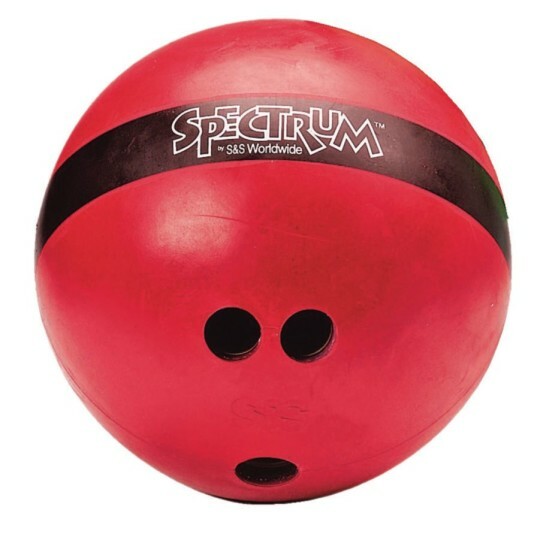 I wanted to add a bowling tournaments to my Middle School PE classes so far the only problem is the color is coming off on the blue bowling balls. This is because we used them outside as well as inside. The bowling balls are holding up and the students are enjoying the use of them. I highly recommend them. These are high quaility and just perfect for indoor or outdoor use. Really great buy for the price. Deluxe Ball = Best results ! This heavy duty ball is perfect for our elderly population at our nursing facility. It is made to last and works great with the bowling ramp. We turn our dining room into a bowling alley and the fun keeps on rolling along! We use these for our clients with physical disabilities. We do bowling as part of are adult recreation during the day in our gym. In the past all the lighter balls that we could find wouldn't knock down very many pins. These balls are heavy enough to knock down all the pins but still light enough that our clients can pick them up! Ultra Bowling Ball 2.5 lbs.